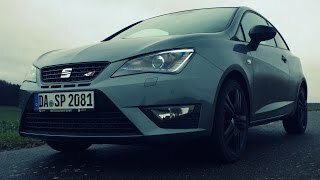 At the Frankfurt Motor Show 2015, Seat unveiled its stunning Seat Ibiza Cupra 2016. The model comes loaded with tech features and comfortable upholstery keeping in mind the infotainment and entertainment segment. 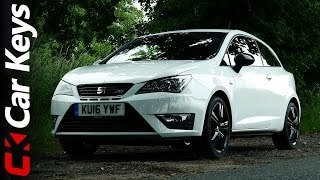 Let us have a descriptive quick look at the review of Seat Ibiza Cupra 2016 to know more about it. The interior of Seat Ibiza Cupra 2016 received a thorough upgrade process giving the touch of redesign to almost all of its elements. It has a highly functional interior portraying precision in its every inclusion. The cabin is driver focused featuring soft touch finishing for comfortable riding experience. There is a new steering wheel while at the center of dash you’ll have newly designed air vents and also an instrument panel housed behind the three spoke steering wheel. Talking about the infotainment and entertainment segment car is well accommodated with the MirrorLinkTM, alongside SEAT Full Link connectivity featuring functions of Apple Car Play and Android Auto. The Android Auto feature provides a swift access to navigation, communications and music application and thus taking entire care of infotainment and entertainment both without compromising with the easy and safe access system. 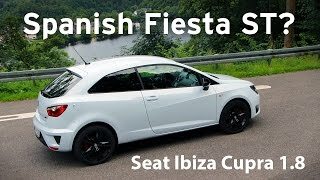 In all rounding up the entire interior details of Seat Ibiza Cupra 2016 I would say it is gem of a creation. Just like the interior, exterior of Seat Ibiza Cupra 2016 is commendably engineered without compromising with the looks. Starting with the front fascia it has bi-xenon headlights alongside the grille while the LED daytime running lights leave behind an impeccable impression. The muscular stance gets more aggressive while moving towards the sides where this three-door coupe is mounted over 17” wheels. The rear view mirrors get the essence of black while the rear bumper and matt black diffuser play their role in an unmatched way. 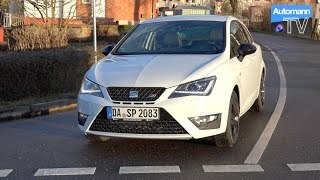 Thus rounding up the entire exterior details of Seat Ibiza Cupra 2016 I would say the elegant, muscular and aggressively designed model is all set to rumble the streets. Beneath the hood of Seat Ibiza Cupra 2016 is a 1.8 liter TSI engine generating total output of 190 hp and peak torque of 320 nm. This takes the hike of around 10 hp and 70 nm in comparison to the predecessor. 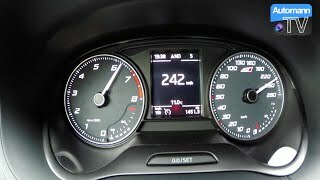 With this new power figures the top speed of Seat Ibiza Cupra 2016 touches the mark of 146 mph while the 0-62 mph sprint gets knocked in 6.7 seconds only.